For anyone embarking on their fitness journey, the choice between working out in the gym and exercising at home can really make or break the entire experience. There are undeniable advantages and disadvantages to either option, and there’s no cookie-cutter answer that suits everyone’s individual situation. So if you’re finally getting around to ticking off that long overdue New Year’s resolution, check out these points to consider when deciding whether or not you should join a gym or workout from home. Money almost always plays an important factor in any equation, and your workout routine is no different. Gyms cost up front through memberships, but working out at home also means getting your own gear. If you’ve set up some big goals, you’re bound to be pulling some big strings, both literally and figuratively, which means the definitive setup of gyms might be the better option for you. Gyms come with their own equipment, professional trainers and staff, and can tailor fit an entire regimen to your needs, guiding you every step of the way and beyond. For first-timers, having professional supervision not only ensures you’re on track towards your fitness goals, but they also keep you from making any serious mistakes that could potentially lead to injuries. In many ways, the cost of gym memberships is well worth the benefits you will get simply from showing up and doing the work. In fact, many gyms offer great value-for-money options for members and potential members, without the restrictions of lock in contracts most traditional gyms have, and with all the benefits and quality services you can hope for in a top-rated establishment, like cleanliness, high quality work gear, strategic location, and a great staff committed to giving you the best experience. On the other hand, working out at home would serve you well if you have smaller goals that don’t require professional equipment, or are able to get the necessary machinery for yourself. Machines like treadmills and stationary bikes are suited for any fitness goal, and though they can be costly, they’re certainly good investments that can really help you crush your targets. While some basic exercises can be done by following a YouTube tutorial or exercise video, some routines require professional supervision not only to learn the ropes, but also to prevent (or address) any unfortunate incidents. Many gyms employ their own in-house personal trainer, and membership packages, especially for first-timers. There are also independent pro trainers who can work with you in the comfort of your own home. As mentioned above, this option is great for those who want to step up their exercise routines with more complex workout or extensive use of machines. Having a coach guiding you through your fitness journey is beneficial for many reasons. Trainers can create a regimen that would actually work for you based on your goals, current fitness levels, health, schedules, and other considerations. They will guide you through the entire process, first teaching you the ropes and ensuring your form is correct, or instructing you on the proper use of gym equipment. They will monitor your progress so your milestones are being met without compromising your wellbeing, and they will keep you on track to guarantee you’ll put in the work, even on bad days. While trainers are great to have on board, you can also get away with doing certain workouts that are simple enough not to require a watchful, professional eye. Exercises like planking, jumping rope, squats, and other full body workouts burn fats and tone your body, and you can easily DIY your everyday routine so you can squeeze in the suggested 15 to 30 minutes of physical activity every day, without too much hassle. As a public space, gyms are a natural opportunity to socialize. If you’re the type of person who gets energized around others, hitting the gym can definitely do wonders to your fitness goals. Surrounding yourself with others who are on the same fitness boat as you, can be really empowering and inspiring to do better at reaching your goals. Working out can feel less of a chore when you have gym buddies to laugh and share stories with, giving you something to look forward to whenever you go to the gym. They can also give you new ideas to improve your regimen, and even help you out with your routines if you didn’t sign up for a professional trainer. On the other hand, if you prefer to keep to yourself, the bustling public gym might feel too crowded, especially compared to the quiet of your home. It’s true that working out at home gives you more privacy than you get at the gym, but there are always ways to feel less intimidated as a first-time gym-goer, like asking for the assistance of professional trainers in using equipment and taking out a membership in a fitness center that provides a welcoming environment for people of different fitness levels. The great thing about gyms is that they can hook you up on a program that would make working out a part of your everyday life. If you’re on a strict fitness schedule, or are worried that you might feel demotivated on your own, this kind of arrangement is a great guarantee you don’t fall out of your goals. Having a fixed schedule means you don’t have to think about when—or if—you’ll work out next, and it takes away the worry that you might not be doing enough to reach your goal. Joining a gym is perfect for those with well-defined goals and want to keep a tight schedule. It’s also a good arrangement to have if you sometimes slip on your fitness goals because you don’t always feel motivated to work on them. But when you may have some serious time constraints on your hand, consider the flexibility of working from home. Everything is at your discretion when you take this option, from the routines you do to the time (and frequency) of your workouts. If you can’t commit two or three hours in as many days to the gym, you can still put in the work at your house. There are advantages and disadvantages to working out at home or hitting the gym. At the end of the day, you need to consider which setup would work best for you, based on your personal needs and interests. Evaluate the costs of each option, see if your goals require professional help or if you can DIY the experience, consider whether you get energized by being around people or prefer to work on your own, and see if your schedule can accommodate fixed appointments or you need more flexibility in your routine. 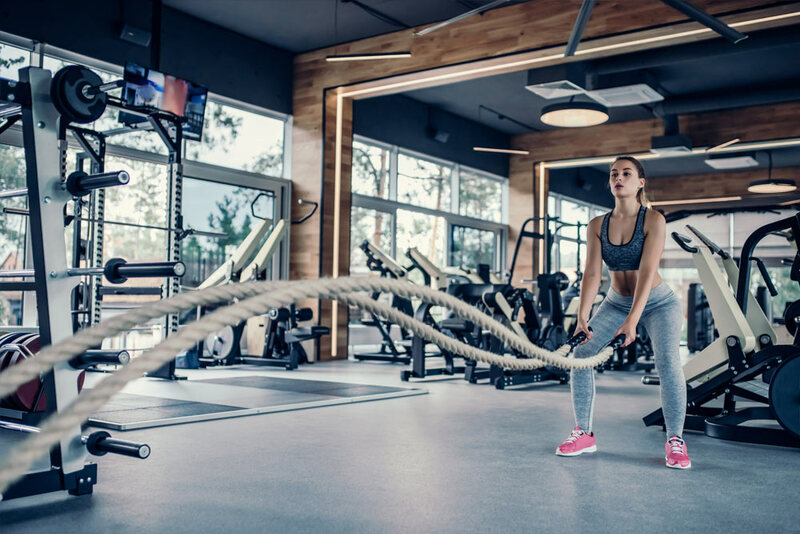 You can also opt to go to a no-contract gym like Rec Xpress if you want to get a feel of the whole place, test out the machines, and see the kind of guidance certified trainers can provide you with. At Rec Xpress, we offer one of the best value gym memberships in the country with no joining fee, so you have the freedom to attend a few gym sessions to see if it fits your fitness needs better than working out from home.